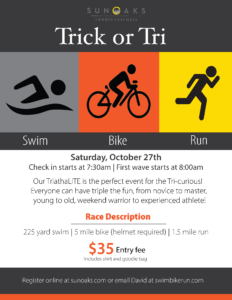 This is the perfect event for the Tri-curious! Everyone can have triple the fun from novice to master, young to old, expert to beginner! 5 mile bike ride—paved road through the scenic Clover Creek Preserve. Helmets Required. Check-in and same day registration.